When Steve and I started dating, we use to wrestle with each other. It was good, honest fun, I tell you. A 6’3″ gorgeous dark-haired man wrestling a 5’5″ woman, eighty pounds in weight under his. He had me in size, in weight, in strength. But the one thing I had in bigger quantity than him was persistence. I would keep coming back, even when he had both my arms pinned. I wouldn’t stop. I just wouldn’t say “uncle”! I may not ever have won one of those awesome matches, but I never gave up! I have seen it other places besides my wrestling matches with Steve. Anyone who knows Jana has seen the personification of persistence. We siblings who have known her all our lives refer to it more as stubbornness, but it is the same thing. Doctors said she would never recover and it was best just to let her go. Three weeks after the accident, although deeply in coma, her heart and brain would not quit, so they did surgery to repair all her broken bones. Doctors said she would never walk once she did come out of the coma. Six months after the surgery to repair those broken bones, she walked back into the Longmont United Hospital to embrace the doctor who did the surgery. She has traveled to Australia, Ecuador, Germany and the Czech Republic, and she has been back over and over to Washington, D.C., to advocate for poor and hungry people all over the world. Maybe I am impatient, but my cause is just. I don’t have a judge to plead to. But I have a persistent prayer about helping my brothers and sisters in Christ. 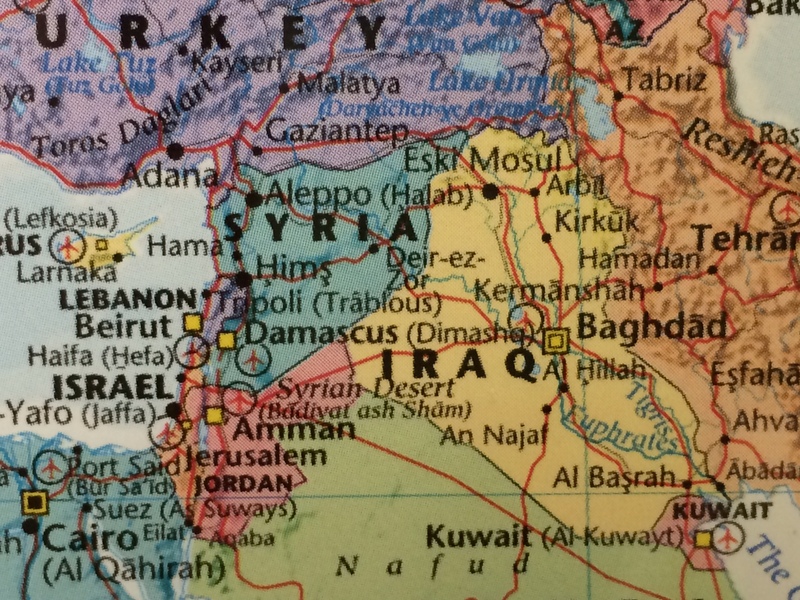 I have been trying to use Facebook and Twitter and email to share the story of the church in Lebanon and Syria and Iraq with as many people as I can. I am trying to create an Internet flashmob, for lack of a better term. If you are my friend on Facebook, perhaps you are sick of my posts by now, but I can’t stop. They all contain the link below and I am trying to get it to go viral, so instead of the 320 views it has now, it will have 3,200 or 32,000…or 3,200,000! The word became flesh and dwelled among us. Now faith is being sure of what you hope for and certain of what you do not see. Those two verses have been with me for most of the past year as I came home from a trip to Lebanon and Syria. The children in that refugee camp had no business to be singing joyful songs and dancing with us in innocence. Didn’t they know where they were? Couldn’t they see the desolation of nothingness around them? The outhouses? The putrid drainage ditch? No parks, no trees…nothing! And that’s when it came to me that they were seeing something else. They were seeing it with the eyes of their heart…with hope. 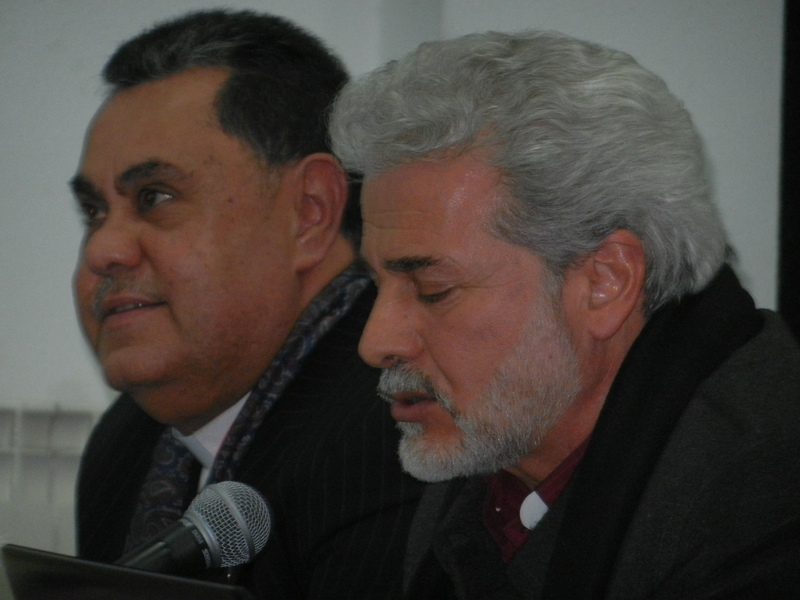 And what they did see with their eyes and feel in warm embraces was the love of Christ in the person of Assis Fadi and Assis Ramsey, pastors of the National Evangelical Synod of Syria and Lebanon. They hope because someone has given them something to hope for. 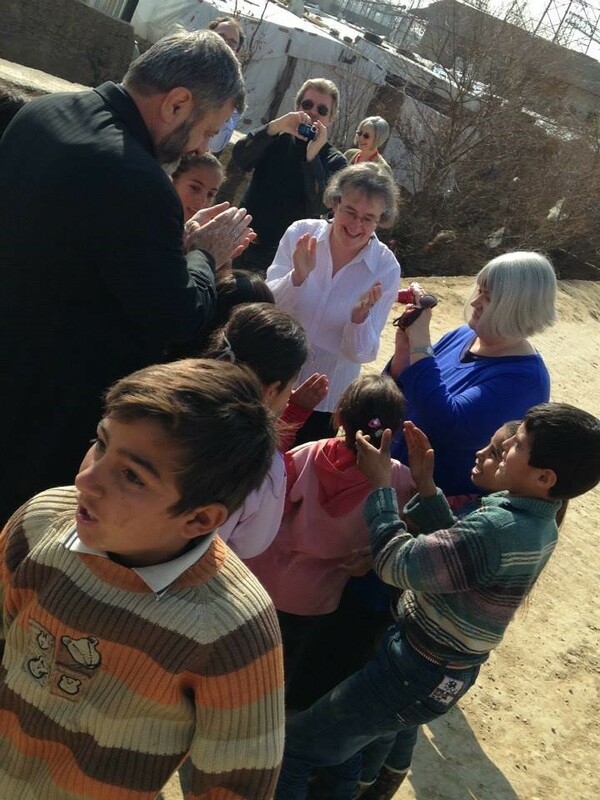 The church has been walking in the camps bringing food and supplies and, well, love. 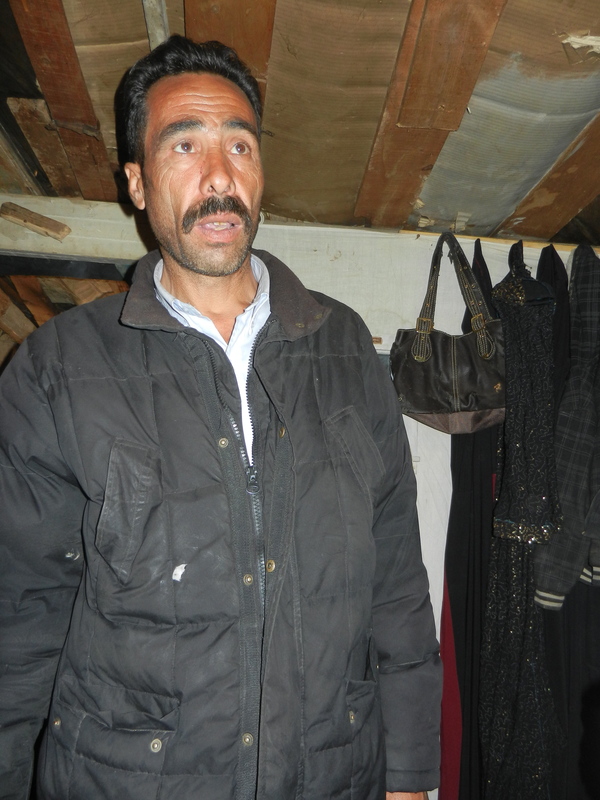 They have been caring for others not in camps by supplying food and rent vouchers and helping children stay in school. They have provided medical care to those who need it. And on their behalf, neither will I.
I have been able to visit the ancient city of Damascus twice. The first time was in August, 2010, when I traveled with eight other women from the Presbyterian Church U.S.A. with the Outreach Foundation. (https://jpburgess.wordpress.com/2014/08/04/faithful-women/) It is an amazing city! We saw the sights and met the people who lived there in peace. 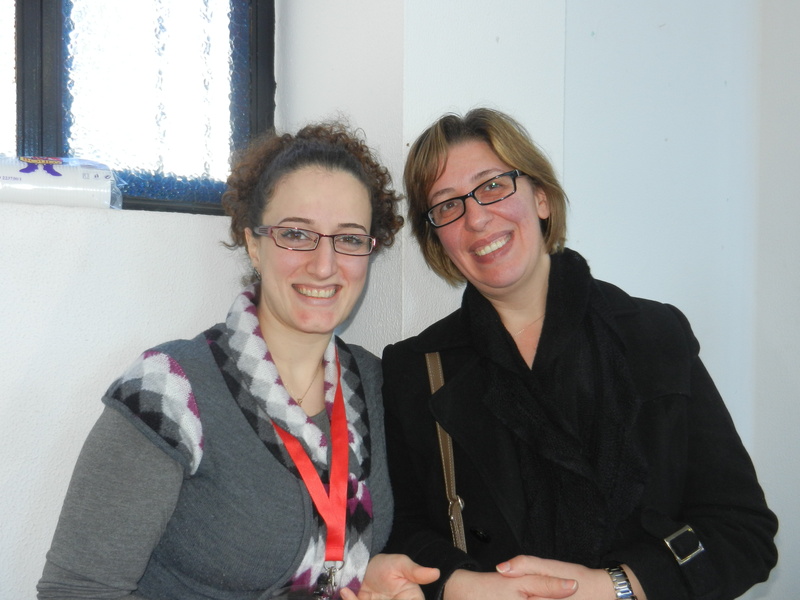 One of the many we met was a woman named Colette Khoury. 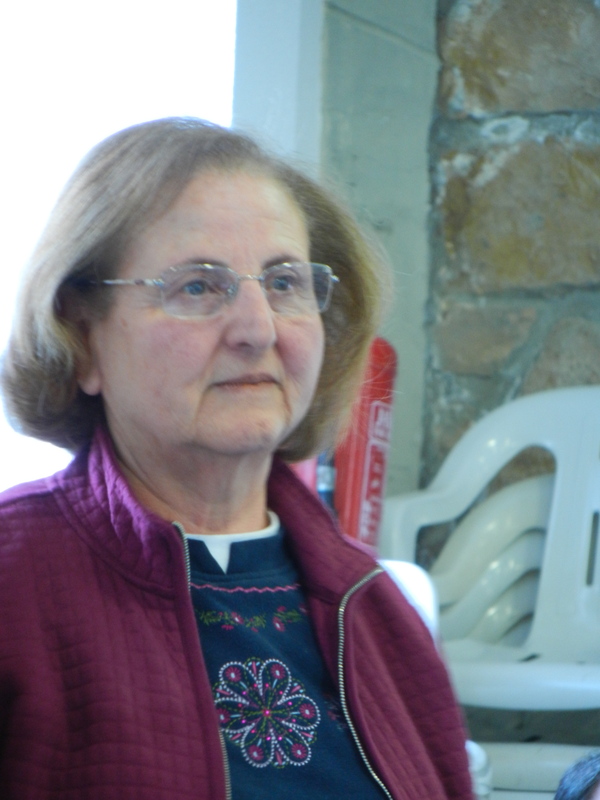 An author in her own right, Madame Khoury is the granddaughter of Faris Khoury, a former prime minister of Syria (the only Christian to ever be so) and a founder of the United Nations. 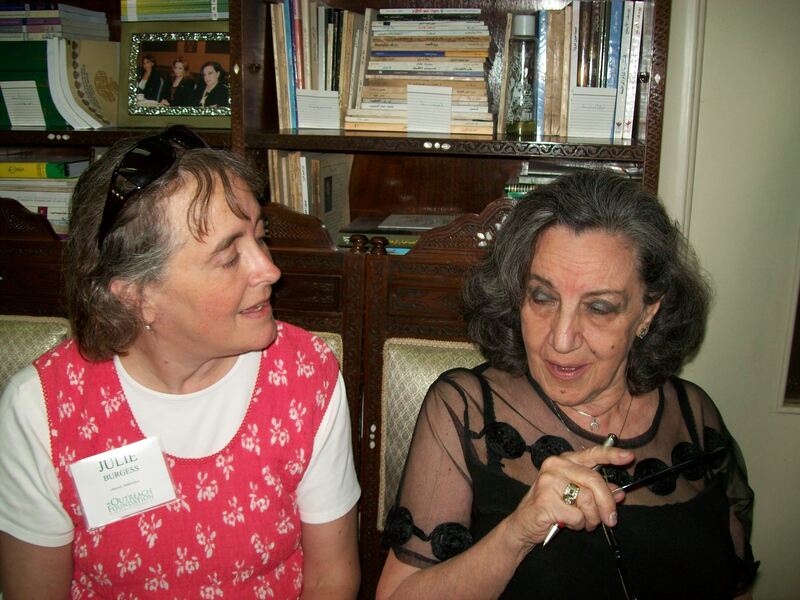 This is me and Colette Khoury, in her Damascus apartment on a hot day in August, 2010. 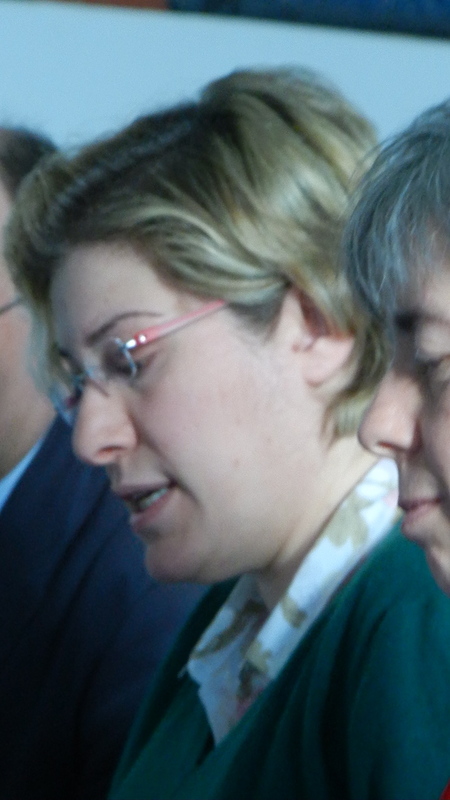 We met so many wonderful people there, including those in the Presbyterian Church in Damascus. 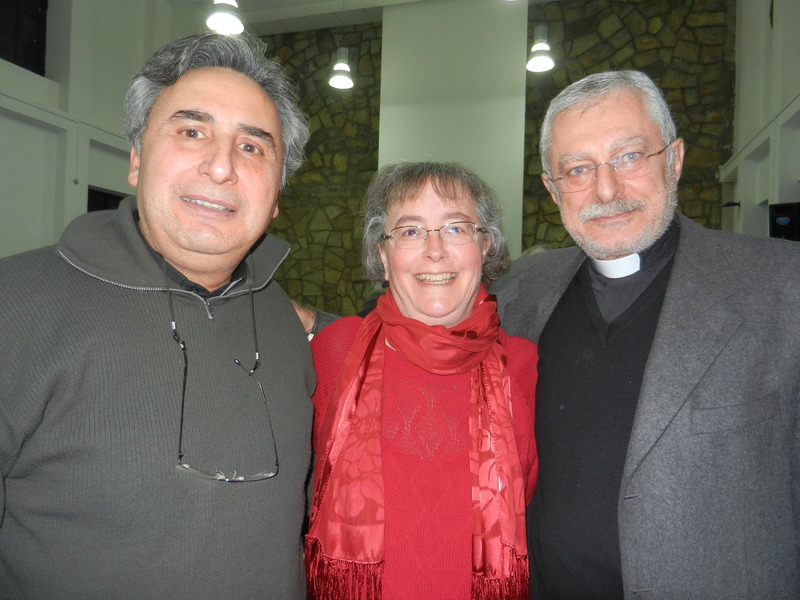 In January, 2014, Steve and I were back in Damascus to encourage those brothers and sisters in the Damascus Church. We experienced amazing worship and fellowship and I think we shook hands and/or hugged everyone in that congregation, grown larger because of the refugees from the war in that city. 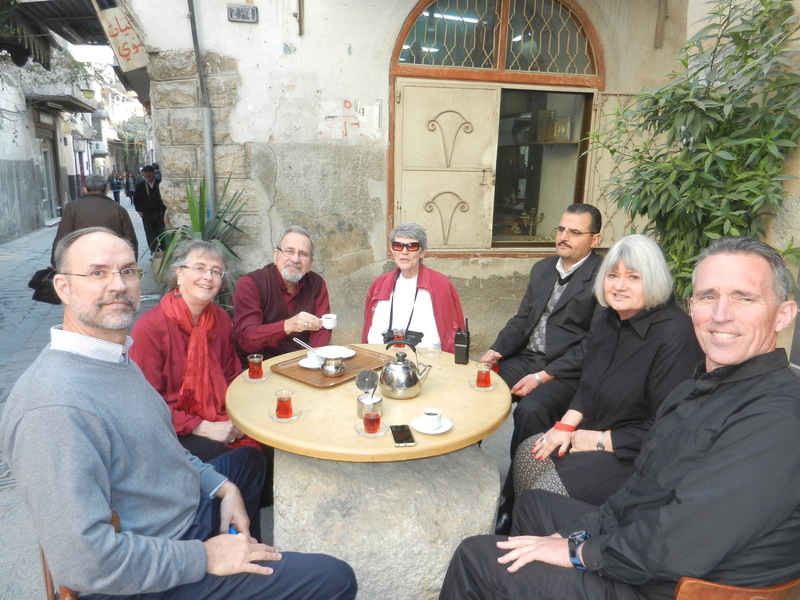 Coffee and tea outside a shop in the Street called Straight, Damascus, Syria, Jan. 2014. The street was quiet except for the mortars we heard. Another change was in the sounds I heard. Yes, there were still honking horns and the call to prayer from multiple mosques, but there were also explosions from mortars falling near the city. “Welcome!”, the head of our security contingent said. Sadly, the people who live there have become accustomed to it. 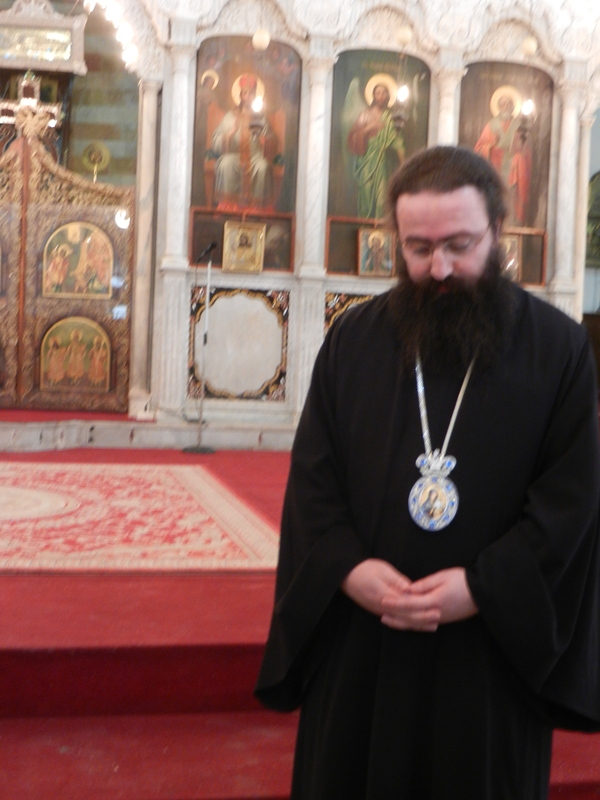 One of the most wonderful sounds we heard was the sound of Greek Orthodox priests singing ancient texts in a church that dates to the third century, their voices resonating off the stone walls and floors. The only word I have to describe the sound is heavenly. Yella, yella, come here quickly! Schweih, schweih, slow down! Tires squeal. Causing some tremors of fear. Each one of us, together, should sing! To continue his musical story. I pray for the end of war. I pray for united nations and peoples. I pray for a symphony of peace. 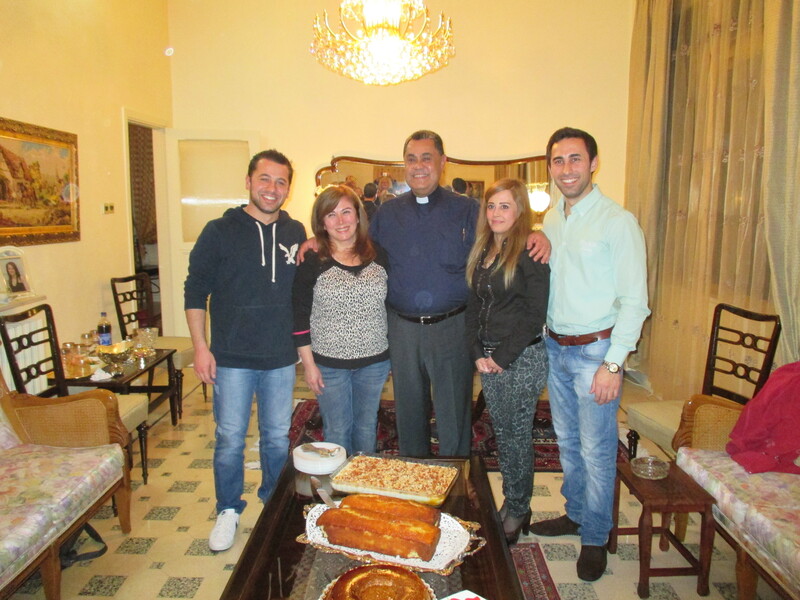 Assis Boutrous Zaour, his wife Wafa and their three children, all amazing young people! Since Steve and I got married on May 18, 2002, we have slept in the same bed every night, with very few exceptions. It’s expected that a married couple would share the same bed, right? Well, I guess Lucy and Ricky on the old sitcom had separate beds, or at least that was the way early television and movies would have it! And let me see the morning light. That is not the way everyone said that prayer, but it was the way it was printed on the night light in the bedroom I shared with my sisters when we were very small. That’s where I learned that prayer when I could first read. Years later when I learned the version that went, “If I should die before I wake, I pray the Lord my soul to take,” it scared me that anyone could pray that way. “The morning light” vs. dying before waking, was a much brighter vision! Either way, those prayers were always followed by the Lord’s Prayer, a Hail Mary, a Glory Be and then my list of family and friends whom I wanted God to protect and bless. It was a long list of people that came to bed with me. There are many people that I pray for regularly. I think it is part of my call as a follower of Jesus to bring those I love and he loves before him; to bring to the foot of the cross all those I carry burdens for. I love them; he loves them more. He knows all their names before I speak them and what a comfort it is to walk with a God like that. I still pray for my family. Oh! How I want their safety, their provision, their comfort. Let them see the morning light! I can’t help thinking as I sleep that I have many family already sitting with God in glory who died before I woke, their souls taken to a place where there is no worry. My mom. My dad. My baby sister Cathy. All are safe on the other side. But here on this side of heaven, are still so many. And this night and the next, they all go to bed with me and Steve. He is as aware of them as me. Steve has traveled to their homes with me to walk with them and learn from them what faith is. They pray for us. We pray for them. And God loves and knows us all. Sleep has been much harder to come by lately and I’m trying to find ways to encourage my body to get to a restful state so once I am in bed, sleep will come. Last evening I took a half hour’s walk as the sun was still up but with a shadow cast upon it by the moon as a partial eclipse was happening. And as I walked my mind had a slideshow, a veritable mental Power Point of all the people who come to bed with me: pastors and preachers and leaders of the National Evangelical Synod of Syria and Lebanon, pastors, elders and kindergarten teachers in Iraqi churches, refugees from Iraq who had been in Syria, refugees from Syria now in Lebanon. Ordinary people living ordinary lives in extraordinary times, loving God in the act of loving their neighbors. And even as a shadow is cast over them right now, just like the moon was trying to blot out the brilliance of the sun last night, we know from the the scripture, “The light shines in the darkness and the darkness has not overcome it. Now I lay me down to sleep, I pray the Lord my soul to keep. Guard me safely through the night…and let me see the morning light. I miss Bob Ross. I used to watch him paint a new painting in thirty minutes every Saturday on PBS. The list of colors of his paint would scroll across the bottom of the screen: titanium white, phthalo green, phthalo blue, prussian blue, midnight black, dark sienna, Van Dyke brown, alizarin crimson, sap green, cadmium yellow, yellow ochre, Indian yellow, bright red. Such exotic names. Such living colors. Remember? He would just take a blank canvas and start brushing color on it. Soon there would be happy clouds, evergreen forests, snow-capped mountains, bubbling streams, wind-tossed waves on lakes or oceans…and over here lives a happy little squirrel. Week after week, he would create a full landscape, narrating a story about a cabin or a farmhouse, and completely draw you in. It was total entrancement for thirty minutes. It was so peaceful in that world he created. I miss that. So today I took a thirty-minute walk in my neighborhood on a Bob Ross kind of day. I just needed to stretch my legs and soak in the crispness of a picture perfect autumn day in midtown Omaha. I headed out the door, turned left on Webster Street, walked up the hill and down to J. E. George Blvd., turned south toward Underwood, pushed the button so the light would change and I could cross Underwood safely to walk down the west side of Memorial Park, then turn east to head to Happy Hollow Blvd. and walk by the creek north to home. It was just about thirty minutes. A sweet yellow Labrador retriever was resting on the phthalo green lawn of a titanium white house behind its midnight black iron fence. He didn’t respond to my “Hi Pup!” or my hand claps, but he seemed happy to be soaking up the sun in his restful position. On I walked past a neighborhood family of young boys tossing a Van Dyke brown football back and forth with their dad. Perhaps the Huskers should come over to this neighborhood to recruit, because those two caught every pass thrown their way. There was no wind to alter the arc of those effortless passes that dad threw. Continuing on my journey, I passed a sweet older couple walking a puffball of a dog that could only have been made by a blend of ochre and brown off Bob’s palette. He had the happiest expression on his face and was a size that could have fit in Bob’s shirt pocket like that little ground squirrel he featured once in a while. Down the walk I went and came across a mom with two little girls whose hair was styled in the bob cut so popular when me and my sisters were young. I couldn’t not comment about how cute they were and it made their mom smile. Ebony was the color of those bob cuts. I turned off the walk a bit farther down to walk through the grass still green with the rains we have had. I was attracted by the crimson red crabapples on a grove of trees and wondered if they were the ones I needed to make my jelly. Alas, they were not. But as I left their company I came across the neighboring grove of honey locusts whose leaves were changing already to the ochres and Indian yellows of fall. And walking on through an aromatic stand of evergreens which made me think of Christmas trees, I trailed through the faded glory of cannas already touched by frost. Their guardian ranks of marigolds and salvia were still glorious in the yellows and oranges and reds and violets that carry us through the summer. Soon they will all be gone, but on this day they blazed in the glory of the sun. And just like Bob could always spin the tale of someone who lived in that wood or on that farm, as I crossed the south end of the park and looked up toward the stark white of the memorial on the top of the hill, I spied a wedding party posing for photos on the curve of the walk up the hill. There was the white of a beautiful dress in the shadow of the trees, surrounded by the dark suits of gentlemen and the dark purple dresses of the ladies. What a beautiful day for a wedding! I think that’s what Bob Ross would have seen as he brushed those colors on the canvas. And walking back up the trail toward home on Happy Hollow, I listened to the last of the cicada song, much weaker now than the loud symphony they give us in the summer. And I heard the sound of younger and fitter steps coming up behind me so I moved over to let the jogger go by, not changing my pace. I’m sure I saw and heard much more than him as his earbuds were in and his eyes were dead forward. Too bad for him! He missed the young boys who were playing down by the culvert in the creek streaming slowly by down in the hollow. He also missed the bright yellow flowers blooming on the vine that covered the dull green fence that is there to keep us from tumbling down the engineered terraces along the walk. He missed seeing the little holes the squirrels had dug to bury acorns and such other delicacies that get them through the winter. Just like the thirty minutes I used to spend with Bob Ross, thirty minutes walking in the neighborhood today invited me into a story of beauty in a small space. In a very large world, Omaha is a small place. In the urban sprawl of Omaha, Dundee-Memorial Park is just a corner. 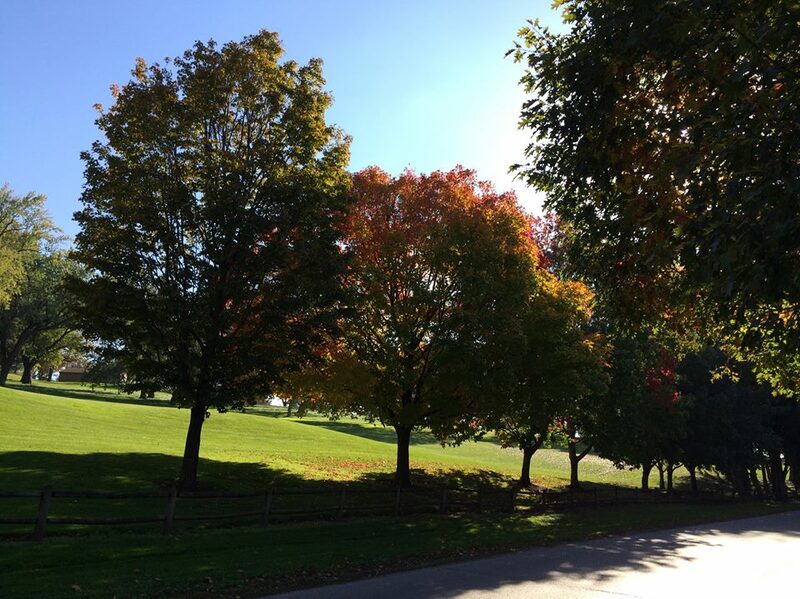 But in my corner of the world today was a phthalo blue sky with happy cirrus clouds and Indian yellow leaves and bright red crabapples and every other color on that list. It was a Bob Ross kind of day and for thirty minutes, there was peace and it was mine. Several weeks ago I blogged about a tree in our backyard on Happy Hollow. It is scheduled to be removed due to rot on the inside from an injury it sustained in a storm several years ago. But today, it is still standing in the backyard, wearing its autumnal coat of oranges and reds, gloriously majestic for now at least. I will miss it when it’s gone…and then we will plant another. Hopefully it will grow into the beauty that its predecessor has been. I love trees and I guess as someone who appreciates the creation around me in the environment I live in, that makes me a tree hugger. That’s what they called us when we were in the Ecology Club at Westside High. We wore the moniker proudly and tried to live into its definition. We did curbside recycling before our city had that program, and we also collected Christmas trees in early January so they could be recycled into wildlife habitat. We loved Fontenelle Forest and we could sing the Woodsy Owl song! But it’s trees I want to talk about today. 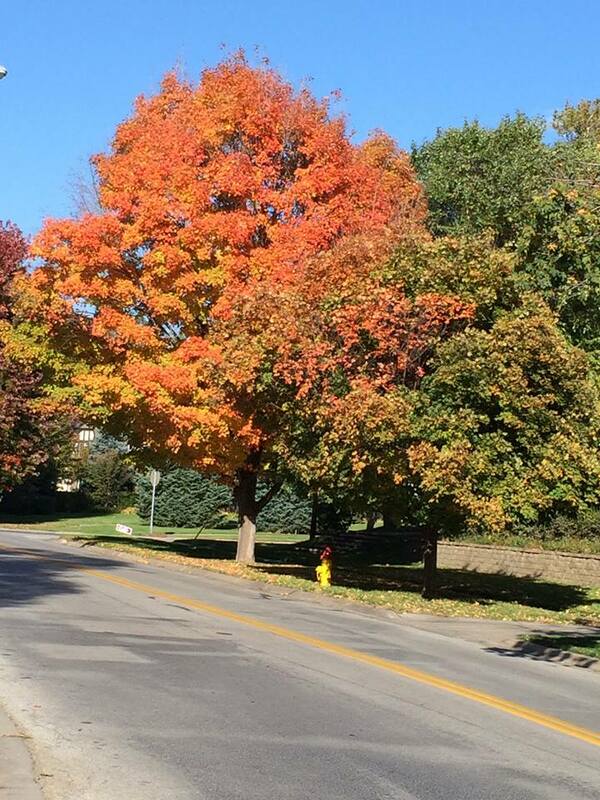 When we were young in Omaha in the 1960s, the American elm tree was everywhere. Oh my gosh! You could drive down streets under a canopy of elms that bordered both sides. Tall and mighty, they formed this dark green roof overhead. We even used to call 90th Street the “dark street” because driving it down it from Pacific to Center the light from the sun could not penetrate the thick covering of elm leaves above. It was like entering a mysterious new world instead of driving down a residential street in suburban Omaha. All over Omaha, the streets were like this. And then the dreaded Dutch elm beetle invaded and over the course of several years, most of those elms were cut down. In our yard alone on 105th Street, we lost seven American elm trees. It was so sad. I can still hear the chainsaws and smell the aroma of those trees as they were mown down. Years later, they widened 90th Street to four lanes, a job made easier because those ranks of elms on the west and east sides were all gone. It was no longer the mysterious dark street, just twelve blocks to speed through in the neighborhood. You can still find an elm tree in Omaha, a lonely sentinel and reminder about what our streets looked like half a century ago. Besides those elms in the backyard we had two other special trees. Well, they were special to us! To Daddy they were just messy: a weeping willow that dropped sap on the windshield of his car, which was too big for the garage, and a mulberry in the back corner of the yard. Well, you know what mulberry trees drop. Oh, but those trees! They were both climbing trees! We even had wooden rungs nailed up the trunk of the willow so we could climb into a sort of fort. Underneath the tree was just as good. That’s where the rabbit hutches were for awhile, and of course the sandbox built out of an old semi-trailer tire. Endless hours were spent under that tree creating villages with roadways for our Matchbox cars. That old willow shaded our recreational endeavors, on summer days when kids used to play outside. The tender, swaying, weeping branches always caused the sun that did shine through them to make interesting and moving patterns where we were playing. The mulberry was in the back corner on the fenceline of our neighbor’s yard. We would get a boost off the top of the fence to get to the lowest branch so we could hoist ourselves up there. For whatever reason, the view not just of the neighborhood, but of life in general was just better from the branches of that tree. We had some tough growing up years with the evil step-mother whom you know from Grimms’ fairy tales, and life in those years was just better up in that tree. Besides, the mulberries were tasty! Both the willow and the mulberry came down eventually, just like the elms. When I was in sixth grade, our school system gave every family a Russian olive tree to plant in their yards for Arbor Day, a tree-planting holiday started right here in Nebraska. I guess the school systems continued this for many years because Russian olive trees were soon to be seen all over the city. They too, were eventually cut down. Not pretty enough I guess for modern suburban dwellers who like less messy trees. The one in our yard that we planted back in 1971 was the last one in our neighborhood to go. Not because it was ugly or messy, but it just finally died. I love the trees. I’m a tree hugger, like I said. 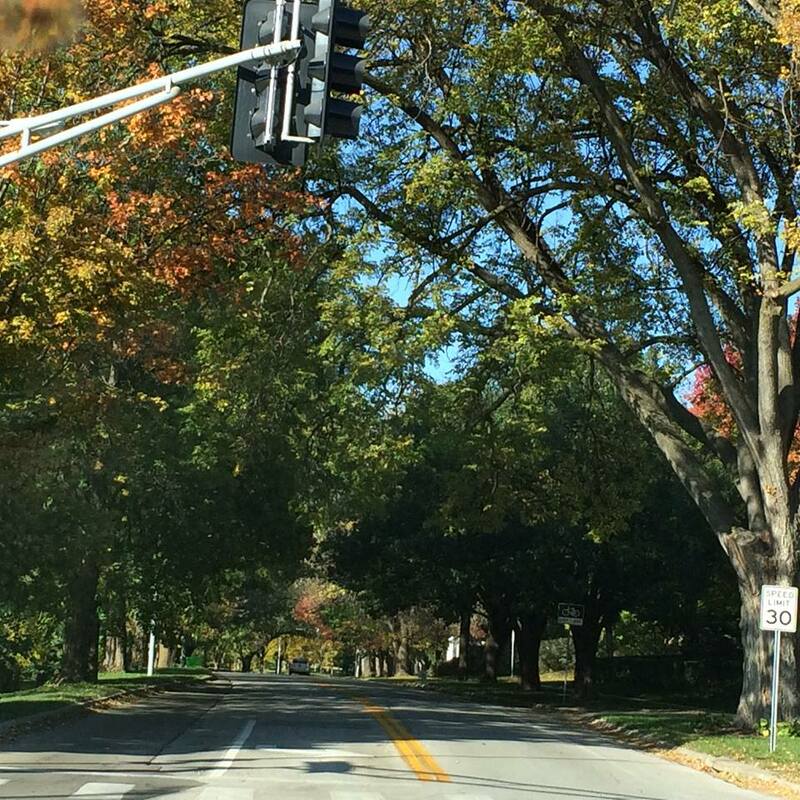 And these beautiful fall days I am lucky enough to drive home through one of the most beautiful places in Omaha, Elmwood Park. Yes, it’s named for trees you can no longer find there, but there are others to take their place, and the most beautiful right now are the maples like the one soon to be removed from my backyard. There is a line of four of them about midway through the park’s upper road that make a wave of color. One starts changing, then the one next to it, and so on down the line. I have seen cars pull over to take their photo. That’s what I did today for this blog! But I have also seen families there having their pictures taken under the glorious covering of their fall colors. Years from now they will pull out those pictures, their children now grown and remember the beauty of the trees in the fall. I will have my photos of those trees, too, I guess. But the pictures I remember of special trees – trees worth hugging! – are only found when I close my eyes. They are not just visual memories either. There are sounds of the wind in their branches. There are the smells of their blossoms in the spring. There are the feelings of their leaves brushing my face and the bark under my fingers as I climb. There are the taste of sweet berries and tart crabapples. God bless the trees! I am so grateful for their beauty at all times, but especially in this season when their colors are as bright as the flowers in spring. They lift my spirits on any day at anytime, but I especially love the way they light my way home from church, with their upper leaves blazing like the tops of candles. 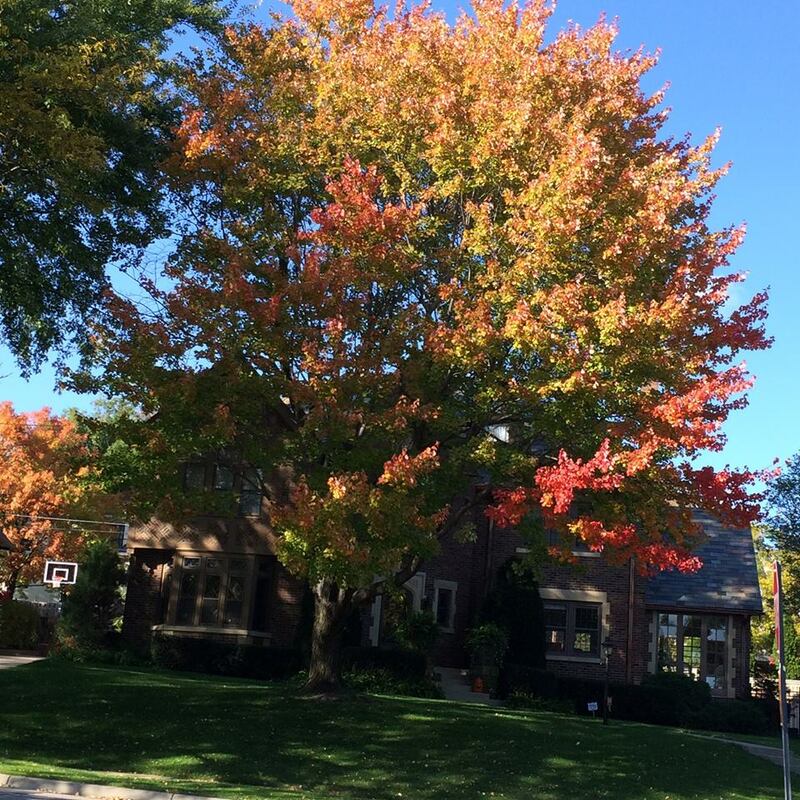 The elms may not spread their arches over the streets anymore, but the maples do. So as I drive home this afternoon, my imagination will take me back to the mysterious roads we use to travel as children and be grateful that I live in the home of Arbor Day. Someone thought to replant that which had been struck down and our tree-climbing days of youth go on!